Rob Mathis sent along an image from Massawepie Scout Camps which as you can see below, contained 3 W’s. 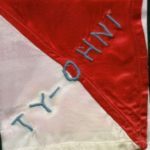 He asked if it was related to Ty-ohni Lodge? I sent out a few request for information, and Bill Boyle responded. The Ws are supposed to be tufts of swamp grass. Someone couldn’t draw. Not related to the Lodge at all. 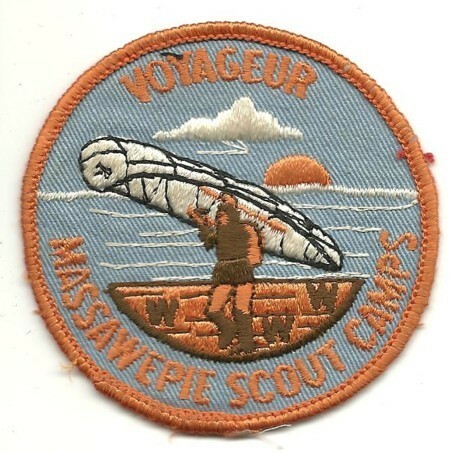 It was the 1973 Voyageur camp patch. So not an OA issue. I would guess what happened was that the original drawing had tufts of swamp grass that looked vaguely like the letter “W”. Then at the patch manufacturer, the artist who was “cleaning up” the drawing was familiar enough with Scout patches to know that a lot of them had “WWW” on them. So the artist mistakenly concluded that “WWW” was what was intended and substituted a clearly-rendered “W” for each tuft of grass in the original drawing.